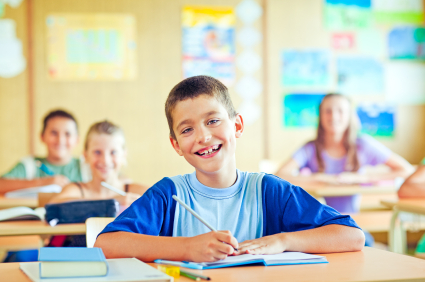 Good dental care helps kids succeed in school! Summer is rapidly coming to a close, and a new school year is soon to begin. With a new school year comes reestablishing routines for bedtimes, homework times, and meal times. This is also a good time to revisit proper oral healthcare rituals and routines. As your Apple Valley dentists, we at Dakota Dental believe an important part of healthy dental habits is routine checkups and cleanings. These appointments allow your family dentists and hygienists to help you and your children keep clean, sparkling smiles. These appointments also provide your family dentists the opportunity to discover if dental care is required to prevent problems from becoming worse and leading to pain, crowns, or extractions. Another key component to proper oral healthcare routines is daily brushing and flossing. According to the American Dental Association (ADA), it is important to brush with a soft-bristled brush at least two times every day to prevent tooth decay. Simply place a toothbrush at a 45-degree angle to the gums and gently move it back and forth on the top, inside and outside of each tooth. Also be sure to brush your tongue to remove bacteria. To clean the surfaces where toothbrush bristles cannot reach, floss at least once a day. As a parent, you are the most influential role model in the eyes of your children. When you demonstrate a commitment to regular oral care, it is likely your children will follow your example. If you need pointers on proper brushing and flossing techniques, or if you have questions about dental care products such as mouthwashes or toothbrush options, please contact Dakota Dental Apple Valley dentists. At Dakota Dental, we are happy to help you and your family maintain healthy teeth and gums and to answer your questions about dental work and products. From general dental procedures to emergency dental treatments to cosmetic dentistry services, Dakota Dental is ready to serve your family’s back-to-school dental services needs.